If you are looking for a great way to tone your up and lower body, then getting yourself a rowing machine is a great choice you. Assuming that you have already bought yourself a good indoor rowing machine for your home gym or found a rower to use down at the local gym, it is time to start those regular rowing machine workout routines to get you fit and tone. Before jumping on the machine, do yourself a favor and get acquainted with how to use a rowing machine so that you use it with the proper form and technique as to avoid any back strain injuries and get the most benefits from the rowing machine. Using correct form also ensures that you build that core strength while targeting the upper and lower body for some targeted toning that is great for your overall health and personal fitness. You’ll also find that using a rower can be a great part of a training regiment for other sports and activities. Knowing proper rowing techniques enables you to get the most out of your use of the equipment. The actual motion itself is a natural one for the body, so it should be a nice fluid, natural position for you once you get going. Though the basic rowing machine position may seem a bit tricky to maneuver at first, you will easily fall into a comfortable feeling with as it you experience the powerful toning transformation of the movements. Whether you are looking for a recommended rowing machine workout plan or just the common rowing machine positions, you can find that info right here. So keep reading for some rower workout tips so that you get the most from the time you spend doing your fitness routine on this equipment. When you are ready to use your rower, just get on the machine and get into the starting position. You will want to secure your feet into the straps so that they do not slip while you’re in motion. Keep the straps snug enough that you don’t move but loose enough that you’re comfortable. When you grip the handles, your hands should go over top and not underneath. Otherwise, you won’t have as much power and be able to achieve the same fluid motions. Plus, you can stress your joints if you’re not pulling the oar handles correctly. The rowing stroke itself should be one continuous motion. You get in the starting point, which is referred to as the catch, with your knees bent or flexed so that the shins are vertical and your arms and shoulders are reaching forward. If you’ve rowed on water, then you’ll notice that this position actually mimics when the oar is placed into the water before you transition into the drive phase of the rowing stroke. This position sets you up so that you can exert maximum power as you move into the drive position, which is the next form in the rowing stroke. The drive phase of the stroke starts as soon as you extend your legs from the catch position. As you extend your lower body, the arms stay straight until the point where your knees are mostly extended. Once that happens, you should flex your elbows and bring the oar handle to your upper stomach while extending your back. In order for your rowing machine workout to deliver a good cardio routine, your drive needs to be powerful. Maintaining a tight core while in the drive position gives you that power and helps prevent back strain. 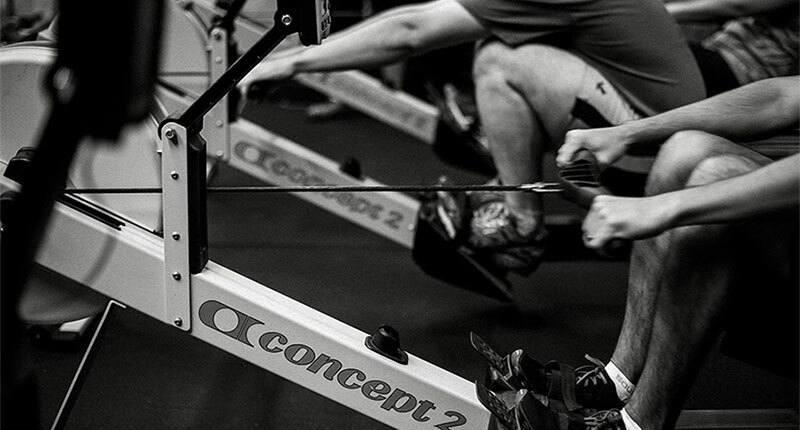 After completing the drive phase of your rowing stroke, you enter the recovery phase. This is basically just when you are returning to the catch position so that you can repeat the whole rowing stroke process over again. The recovery position starts where the drive position ends, with your arms and hands moving away from your body as you extend your elbows while the upper body glides forward over your hips as the same time as your hands are moving by your knees. Your knees start to flex as the seat slides into the catch position. See the transition between the positions in the GIF below. When using a rower for the first time, start out with the resistance setting on a low level until you get a good feel for the machine and the hand of correct form and posture. As you get comfortable, you can raise the resistance level. Typically, machines have resistance levels that go up to 10, with that being the highest or most resistance. Those new to rowing machines should go no higher than a three on the resistance, at least initially. On new machines, the resistance level is usually changed on the digital display. But if you have an older (or even a cheaper) machine, then you’ll likely just have a resistance knob down near your feet that you have to turn to raise or lower the level of resistance.